i>Clicker is a response system that allows you to respond to questions that are posed during lecture. Generally, 5-10 questions will be asked during each lecture to reinforce a concept just covered or to determine student’s preconceptions and understanding of reading assignments. These questions will appear on the projector screen as part of the lecture slides. One point will be awarded to each student that answers the question; one additional point will be given for the correct answer. The questions may be reviewed later by downloading the lecture slides from the course website or by viewing the i>clicker page within the course website. In order to receive credit, you will need to register your i>clicker remote online according to the instructions in the following section. 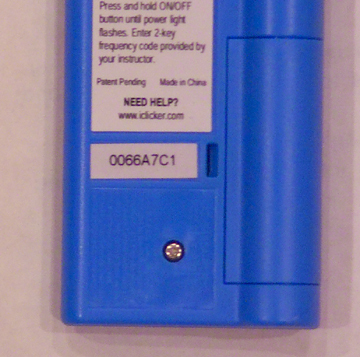 You may purchase an i>clicker from the vendor’s website (www.iclicker.com) or through Amazon.com. Either i>clicker 1 or i>clicker 2 may be purchased for this course. Once purchased, you may use your i>clicker in any of your classes requiring them that semester or in the future. Simply follow each instructor’s registration instructions separately. You may also loan your i>clicker to peers for use in their classes; however, only one individual can use an i>clicker in a single class at a time. In other words, two students in the same class cannot share one i>clicker. Students that do not wish to purchase an i>clicker will obtain a loaned i>clicker from their instructor at the beginning of each class. The same i>clicker must be used throughout the semester. Be sure to make a note of the identification tag on the front of the i>clicker during your first use so that you are always using the same i>clicker for each class. At the end of class, the i>clicker must be returned to the instructor. If you purchase an i>clicker later in the semester and would like to use it instead of your loaned i>clicker, you must bring the purchased i>clicker to your instructor so it can be registered to your name. The remote ID is the series of numbers, and sometimes letters, found on the bottom of the back of your i>clicker remote.